A statue by Mario Chiodo was given to Kaiser Permanente on behalf of Get Screened Oakland. DEC. 1—Guests at a City Hall World AIDS Day Community Awards Ceremony got an early glimpse tonight of a 50-foot long bronze monument planned for a new city park in downtown Oakland. “We are here as a testament of what is truly important and that is us, the livelihood and survival of our community,” Vashone Huff, deputy of intergovernmental affairs for the city of Oakland, said before a scale version of the statue, less than one-tenth the size of what artist Mario Chiodo has proposed, was presented to Kaiser Permanente. Entitled, “Remember Them: Champions for Humanity,” the model monument unites the figures and faces of global humanitarians from Mahatma Gandhi to Rosa Parks and served as a Get Screened Oakland award for the organization’s continued work to ameliorate the alarming rate of HIV and AIDS infection in Oakland. Crowds gathered in Oakland's City Hall for the World Aids Day Community Awards Reception. Huff spoke on behalf of Mayor Ronald V. Dellums, who, due to a last-minute personal conflict, could not make his scheduled appearance, according to city officials. In his absence, presenters for the evening emphasized Dellums’ work in AIDS and HIV detection and prevention throughout his political career, including his leadership role in launching Get Screened Oakland, a year-old campaign aimed at ensuring all Oakland residents ages 13 to 64 get tested for HIV. Eight years ago, as congressman, Dellums advocated for $200 million a year to fight the disease in Africa and this past October, as Oakland’s mayor, opposed and ultimately stopped a proposed budget cut that would have reduced AIDS prevention funds in the city by $100,000. In addition to Kaiser Permanente, Get Screened Oakland gave awards to five other organizations including Cal-Pep, the California Prevention Education Project; ClearChannel Radio, which officials said had helped with outreach; and the Ramsell Corporation, the international pharmaceutical corporation born in East Oakland. Awards were also given to six individuals recognized by the Alameda County Office of AIDS Administration. 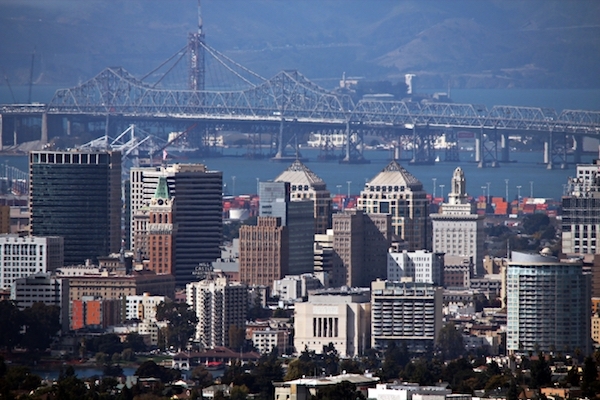 According to statistics released by Get Screened Oakland, Oakland’s HIV infection rate is seven times the rate of any other city in Alameda County. Countywide, there have been approximately 7,000 cases of AIDS, a third of which have been diagnosed since 1997, according to the reports. In fact, these numbers are likely even higher, according to recent research: this past August, a Centers for Disease Control and Prevention study revealed that the United States as a whole has been underestimating annual HIV infections by more than 40 percent for the past decade. At the reception tonight, Greg Miller, a Bay Area resident nurse who manages AIDS and HIV-positive cases, said he was concerned the statistics reflected a lack of health care in African American communities and a limited city budget. Get Screened Oakland volunteers administer swab-tests for HIV at Eastmont Town Center, and at citywide events such as Cinco de Mayo and Art and Soul. But since the organization’s inception last year, 1,000 residents have been screened for the virus owing in large part to community and faith-based organizations that joined the campaign and screen on a regular basis independently, said Get Screened Oakland founder Dr. Marsha Martin. A reception was held before the World Aids Day Community Awards.